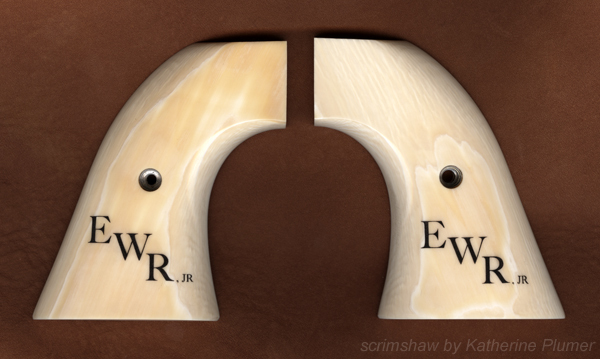 My life, under the microscope...: scrimshaw initials on Colt pistol grips! I do like a good ivory pistol grip, yes indeed! My most recent pistol grip job was putting the client's initials on the grips. Though much faster than scrimshaw that involves "drawing" animals or figures or scenery, lettering certainly does present its own challenges! I have to say these turned out great. Like the other grips, these were for a Colt .45 SAA. These have the screw hole though, just a different method of attaching them versus the other ones I've worked on. I don't know enough about them to tell you why some are one way and some are the other. Who picked the font? You or the client? -BMc. I offered a few possibilities, he picked this one. I certainly agree with your sentiments about ivory scrimshaw pistol handles... beautiful work! Do you remember the name of the font? I would like to use it on a rifle case I'm making for my dad.